Uncategories The Wonderful Health Benefits of SANTAN: Heals Wounds, Anti-Diarrhea, Antibacterial, Antitumor and Many More! The Wonderful Health Benefits of SANTAN: Heals Wounds, Anti-Diarrhea, Antibacterial, Antitumor and Many More! 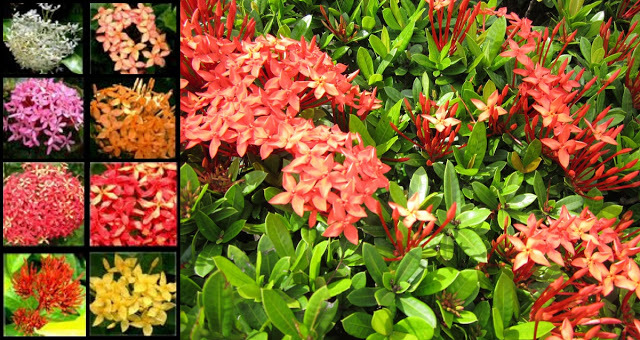 SPONSORED LINKS Ixora or Santan flowers are tubular and bloom in dense rounded clusters about 2 to 5 inches across. Santan flowers are beautiful and bright. The colors depending on cultivars may be white, red, orange, pink or yellow. Santan flowers bloom all year round. Santan fruit is reddish, almost round, about 5 mm diameter. In a report published in “Fitoterafia 1999” entitled “Effect of Ixora coccinea flowers on dead space wound healing in rats”, the alcoholic extract of the flowers of Ixora coccinea was studied for its effect on wound healing, using a dead space wound model in rats. Significant increases in granuloma tissue weight, tensile strength, hydroxyproline and glycosaminoglycan content were observed. The prohealing actions seem to be due to increased collagen deposition as well as better alignment and maturation. The drug induced a hypertropic effect on the thymus gland but had no effect on the adrenals. In a report entitled “Ant diarrheal activity of flowers of Ixora Coccinea Linn. in rats” published in “Journal of Ayurveda and Integrative Medicine, 2010” has shown that the aqueous extract of Ixora coccinea (santan) showed significant inhibitor activity against castor oil induced diarrhea and there is a significant reduction in gastrointestinal motility in the charcoal meal test. This result substantiate the antidiarrheal effect of the aqueous extract and its use by traditional practitioners in the treatment of diarrhea.